Located to the right of the main entrance. The Ina & Jack Kay Theatre is a classic proscenium theatre that combines the atmosphere of an “Old Broadway” house with the amenities of a state-of-the-art performance venue. With a massive fly system, theatrical lighting, expansive wing space and an adjacent scene shop, the theatre accommodates the complex sets of opera, dance and theatrical productions. 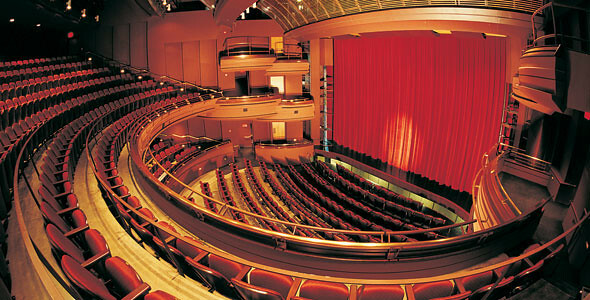 Yet the theatre, with its 626 seats, provides a warm setting for small music ensembles, ceremonies or lecture events. The Kay Theatre, like the Dekelboum Concert Hall and Gildenhorn Recital Hall, has a specially designed noiseless ventilation system. Fresh air is constantly provided through a gravity-fed ventilation system that keeps the ambient temperature comfortable, but without the annoying sound of forced air. Concert attendees hear nothing but the music. Jack Kay (’47) and his late wife Ina generously supported the Clarice Smith Center and its programs with their naming gift. Mr. Kay is President and Chairman of the Board of Kay Management Company, Inc. He has been a tireless supporter of local, national and international organizations and charities and has served on the boards of more than 20 organizations, including the University of Maryland College Park Foundation. His support at the University of Maryland includes the Jack Kay Banneker Key Scholarship, the Abraham S. and Jack Kay Chair in Israel Studies and annual support for the Clarice Smith Center. For technical specifications of the Kay Theatre, click here.